I am currently in between projects. I do have an afghan that I need to start on for a wedding present but I haven't made it to the craft store yet to pick up the right color yarn. I needed something to keep myself busy so I started whipping up grannies in all different colors to use up some of my yarn scraps. 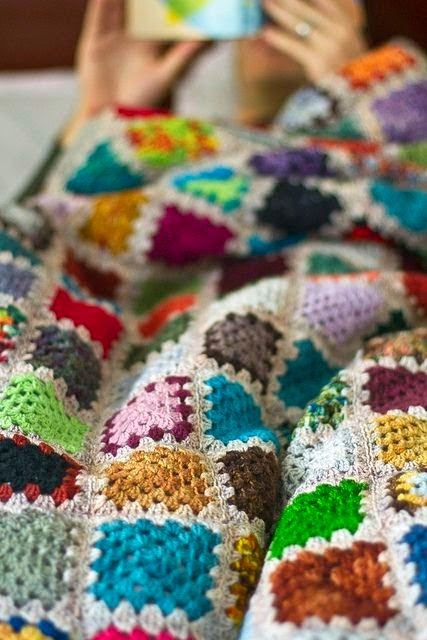 I'm not normally a big fan of granny squares but when I saw this afghan on Pinterest I fell in love. There's something so primitive and old fashioned about it. I tried tracking down the source of the photo to give proper credit but it leads nowhere. I'll just go by the photo. Seems easy enough. Four rounds on the granny square, last round in white and then join. I probably won't finish it anytime soon. It will be one of those standby projects that will get worked on here and there in between other projects. Hope mine turns out as nice as this one. Hi Beca, what a great way to use up your yarn stash! When it's finished it will look beautiful. I too like to have more than one project going at a time. Right now I'm making a granny square cowl that I'm going to donate to our church for their Christmas Crochet Sale. Have a nice week. I have always loved granny square blankets...especially the ones like this that look "quilt-ish). Sadly, I cannot crochet so I've never made one, but it's one of the skills on my "to start to learn this year" list. Thanks for sharing. Great inspiration. I like this idea of using white with all the colors in between. I am making a prayer shawl with 2 1/2 inch grannies that make up into what looks like a nine-patch quilt with off-white as the main color. Come to my blog and see, if you'd like. It is a good way to use up yarn scraps. Love all the colours together - it will look gorgeous! Love your stack of granny squares. The afghan you found is beautiful. I just got a Learn to Crochet" book from my library. Wish me luck! Love the squares - the colours go so well together, and what a great way to use scraps. A beautiful granny square afghan!! A wonderful afghan indeed !!! Have a creative day ! In between projects? You must have more self-control than I do. My affliction with startitis means I'll never be without a handful of WIPs. I have come to appreciate the granny square. The one in the photo is wonderful! Your granny squares look very neat. They would make a lovely afghan! just hopping over from KCCO - I always seem to be drawn to granny squares! What a beautiful cozy blanket they will make!